My two friends and I stayed at the Colonial Manor B&B for a moms get away and had the best time!!! The food was delicious, the owners were so helpful and the rooms are lovely with comfy beds! Next time I hope we can get away for two nights instead of one ????????????‍♀️!!! Thank you so much for taking care of us during our recent stay! Our room was amazing, the food was great, and the scenery was serene. We appreciate it so much. Thanks! The Castillo Chateau at the Colonial Manor is a room to remember. From the beautiful quilt to the quaint chairs, you feel you’ve been taken back in time. There was plenty of room to have a teeth-brushing party intuit huge bathroom. An evening well spent at the Colonial Manor even though we were in town for unfortunate circumstances. Thank You for having us! Our stay at the Colonial Manor was above and beyond any of our imagination. We both gained weight from the two course breakfasts. We would recommend it to anyone who wants to get away from the traffic of life and be refreshed from God’s creation all around the residence. What an enjoyable stay at your charming B&B! We truly felt pampered and spoiled! You went above and beyond our expectations making sure our every need was met. Our Breakfasts were so delicious! We will defiantly be back. Thank you so much for an amazing stay! After a long four days of traveling from New Zealand, this was the perfect place to rest and unwind for the rest of our trip. Debbie you were absolutely fantastic and insured that everything we would need and more would be cared for. You made us feel so at home at this Colonial Manor, it really was one of the highlights of the trip. All the best for the future from your first New Zealand visitors. Maria and I loved our weekend in your warm and wonderful Inn. What a blessing to have met you, and we are looking forward to many more visits here with you. You truly have the gift of hospitality! May the Lord bless you! I had such a wonderful time staying here! What a beautiful and luxurious place to come home to each night of my work trip. I will absolutely be back the next time! Thank you for the kind hospitality and gracious home you shared and the treats! What a beautiful bed-and-breakfast! Beautiful home and property, so close to Wittenberg University. The breakfast was amazing! I can’t wait to come back and see the fall colors. Quite lecture us. The treats in an emergency basket in the room were so nice. Thank you Debbie and Brent. What is the price of finding new England Inn right here in Ohio! It felt so much like staying in someone’s home that I forgot to lock the door to my suite. I felt like Laura Ashley in my bedroom. Such a charming elegance. Thank you for making my stay so enjoyable. What a great find! Comfortable, Home feel, and so welcoming. Thank you! We will be back, and recommend your lovely in to our friends. 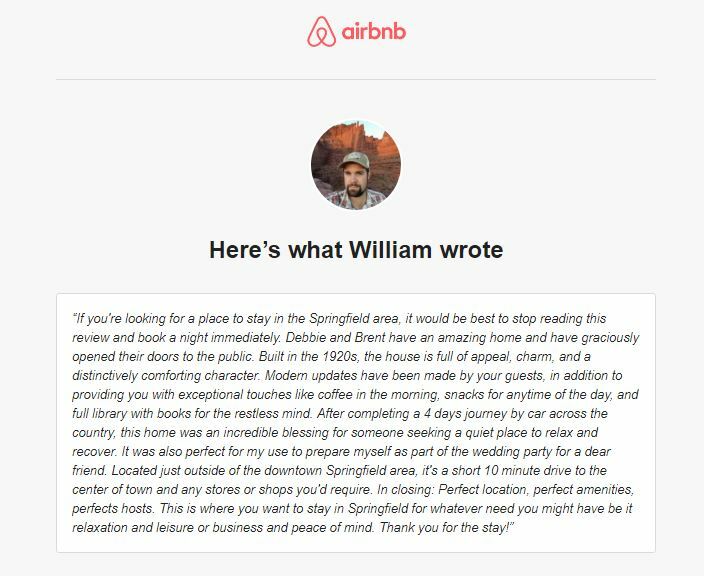 We really enjoyed our stay there and was comfortable, and you were so welcoming thank you. Thank you very much. I have spent a fantastic weekend at your B&B . I felt so relax and Tranquill. It was great having the opportunity to meet you and your family. Your hospitality and help provided were phenomenal. I wish you and your family great things and many blessings.